Home Science & Society Another Parliament Session Wasted, But Who Gains? Another Parliament Session Wasted, But Who Gains? With the Parliament’s winter session set to end on Wednesday there is already a feeling of big disappointment within the country. Now with just 2 working days remaining of the winter session, an all-party meeting was convened by Rajya Sabha Chairman Hamid Ansari where the government and opposition arrived at an agreement to pass key pending bills on which there was general consensus, skipping the contentious GST bill. 6 bills are slated to be passed in the remaining 3 days from (Monday to Wednesday). This Winter Session itself was largely a repeat of the Monsoon Session. 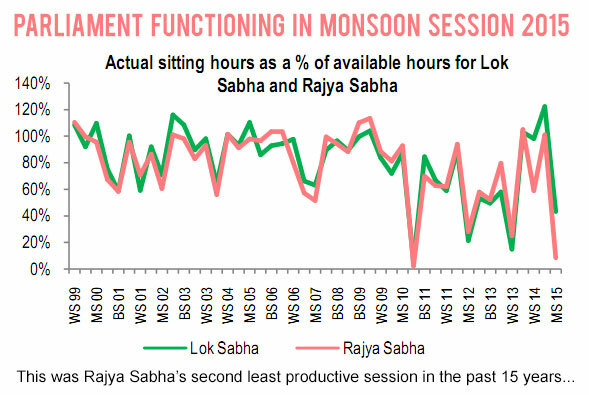 The Monsoon Session of 2015 has been one of the least productive sessions in the last 15 years with repeated disruptions in both the Houses and both Houses losing around 75 per cent of its allocated time for business. While several Bills were introduced in the session, only one Bill could be passed by Parliament. Rajya Sabha productivity was 9% during this session. In the past 15 years this is the second least productive session, the worst being Winter Session 2010. So what changed from Monsoon to Winter? Ultimately, what did India gain from Parliament’s Winter Session? 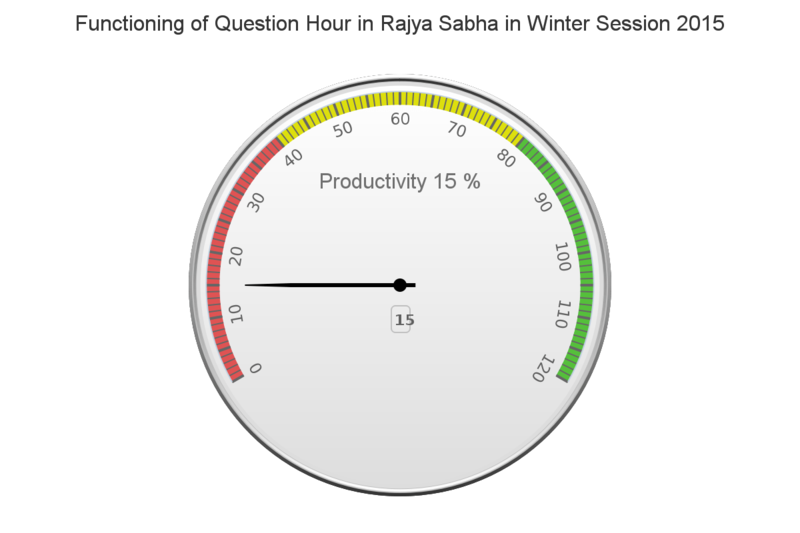 The productivity of Rajya Sabha in this Winter Session of 2015 was almost 45% with the functioning in the question hour at a drastic 15% low. Each minute of running Parliament during sessions costs the exchequer Rs 2.5 lakh. That is to say 1.5 crore is paid by from the pockets of Indian citizens for every hour wasted in the Parliament. Parliament Washout – Who Gains? The illusive question that still remains is that who gains from the Parliament sessions being washed out? If Lalit Modi controversy and Vyapam scam spoiled the Monsoon Session, the Winter Session was washed out with allegations and counter-allegations on issues ranging from ‘intolerance debate’ to ‘National Herald’ allegations to ‘Delhi Cricket Association’ corruption case to the Nirbhaya case. Ironically, the same NDA government which is pushing forward the GST Bill, was the one who strenuously opposed it during the 2009-2014 period. Infact, most of the major NDA policies itself were introduced during the UPA rule which NDA is pushing forward now with renewed cultural sounding names and the Congress interestingly opposing the same bills they themselves introduced. 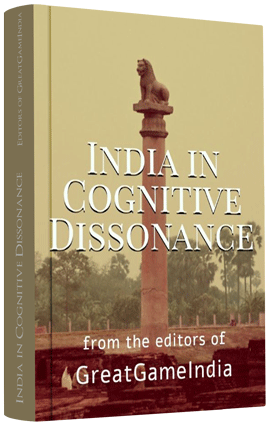 This illusory dichotomy of a ruling/opposition coalition is explained in greater detail in our report titled The Heroic Saga: The Escape, Exile & Death Of Bose. Recently under RTI, when the information on the details of Lal Bahadur Shastri’s death was requested, the home ministry replied vaguely that they cannot reveal the information as it hurts the interests of their trade partners. Are these the same trade partners who are the actual beneficiary and who gains the most if bills are passed in Parliament without any discussions that would bring into full public view many uncomfortable questions and issues related to those bills? Who are these trade partners who are most important to India than the right of people to know about the death of their late Prime Minister? Who are these people whose business and political interests are hurt with the revelation of the entire details about the bills passed in the Parliament? Are these people more important than the people of India? Are they Indians or foreigners? Why does every government of India, left, right or center, elected by the people of India, work for these selected persons rather than for those who elected them? If government of India is working only for a few select business interests then are we agents for someone in administering people and land for our Masters, or, are we a nation or republic? If we are agents of someone, then who are our Masters? Is it not true that for past 10 years, every coalition government had all the details of black money holders from India, and their accounts and sums outside the country? Till date, even after repeated requests from the Parliament, it was never fully revealed because again it hurts the interests of black money hoarders who support the political parties of all shades now, and they cannot be brought to justice. Is it not true that everyone who became political, spiritual, religious leaders and came to power promised to bring the black money back to India and once coming to power forgot that? Is it not true that the black money generated inside (in)dependent India in the last seven decades by loot and plunder of Indian people by Indian leaders (political, spiritual and religious) is thousand times more than what was supposedly looted by invaders in the past? Robert Clive, who was just a clerk in the East India Company, made money enough for 60000 generations by loot and plunders. In 2012, when his grand children auctioned one cup of gold and a dagger, they got 180 million pounds. They informed that they sold these items for their pocket money and still there are a few warehouses of the same stuff in England. We request every reader to think independently on these questions if we want to be true republic rather than an (In)dependent nation. But than the real question is are we independent in the first place?